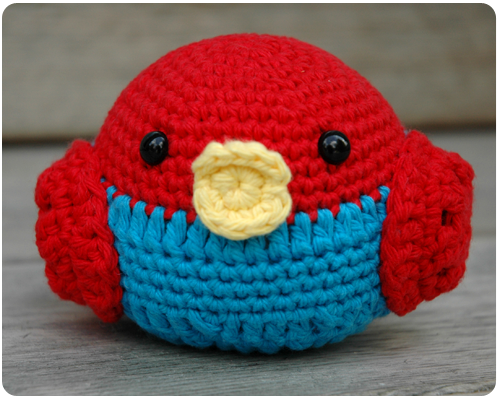 I just finished crocheting this chubby bird, and he really lives up to his name. No, he is not for my girls, he is for me. 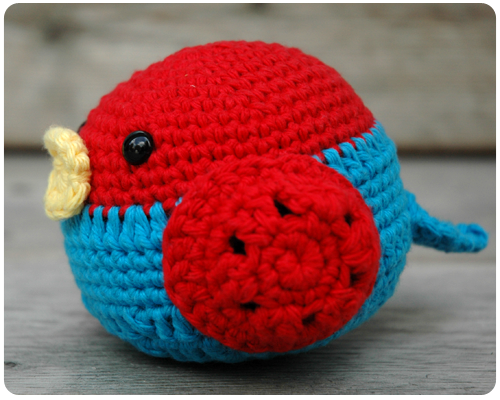 The pattern is available here should you wish to make a chubby bird of your own. Well today is a happy day....I have the day off work to spend with my girls, the sun is shining, and I have a finished project to show you. Isn't it gorgeous? I am absolutely thrilled with how it turned out. 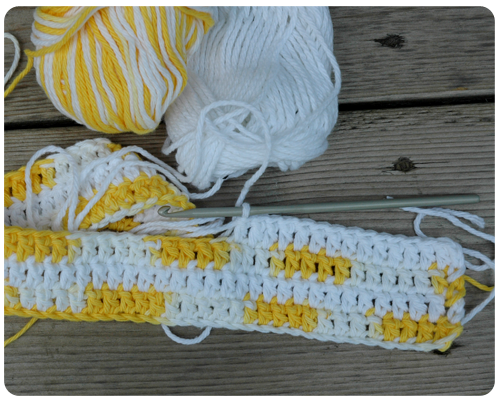 I sometimes find variegated yarn a little iffy to work with, not knowing where the colors will change as I crochet along and how that will affect the overall finished project. Well, it turned out okay here if you ask me. 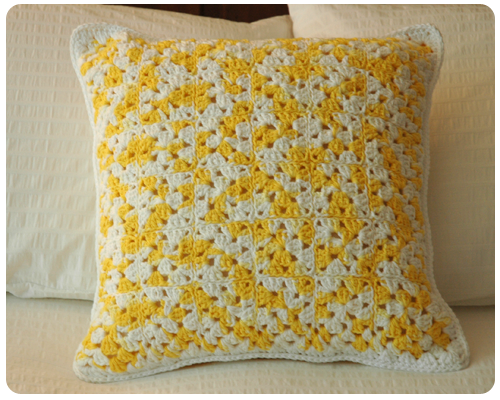 My Sunshine Pillow is at home on our bed, adding a pop of yellow to an all white duvet cover (that I put on the bed a few weeks ago when I could not stand the site of our 10 year old one anymore). 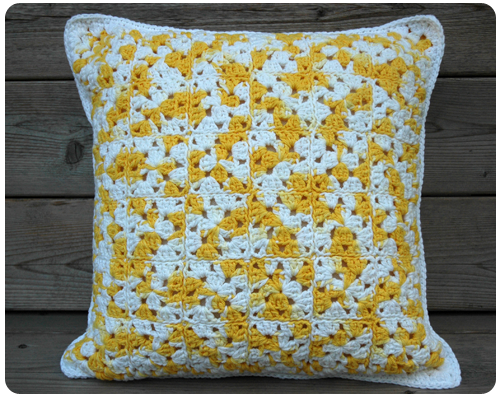 I am certain I have said this before, but as I add another crochet creation to my home, I feel the need to shout my love for the handmade from the rooftops (well, not really) again. 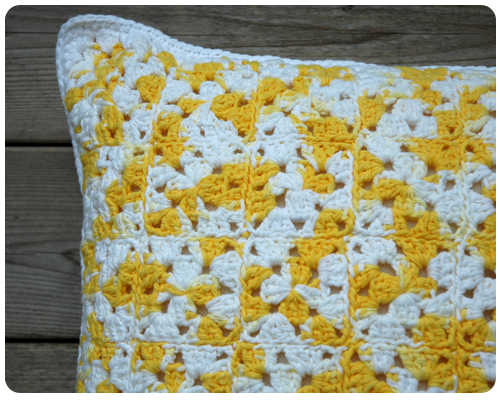 Since I really got crocheting again, maybe five years ago now, I cannot believe all the things that I have made, many of them for my home. 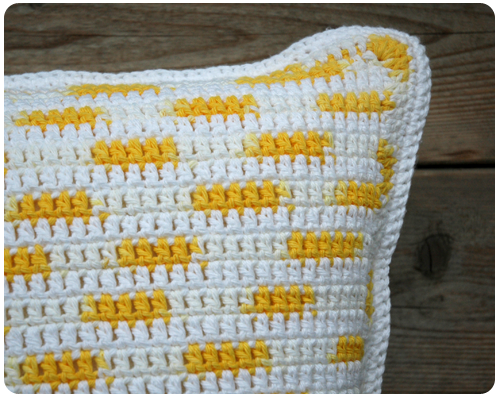 I love the homespun and cozy feel all these yarn creations add, the way they reflect my personal taste, and that they are unique and one of a kind. Hooray for handmade! Wishing you a happy day full of sunshine. Does anyone else find it hard to do paper crafting in the summer? I do. With the weather being so nice and the garden work to be done, not to mention all the family activities that fill up the weekends, I find it very hard to go downstairs to my craft table and work with my paper. And with all the supplies I need, I can not very well bring my paper crafting to the beach...so needless to say my paper crafting slows down considerably in the summer. But every two weeks, armed with a new sketch challenge from The Memory Nest, I do get something done. 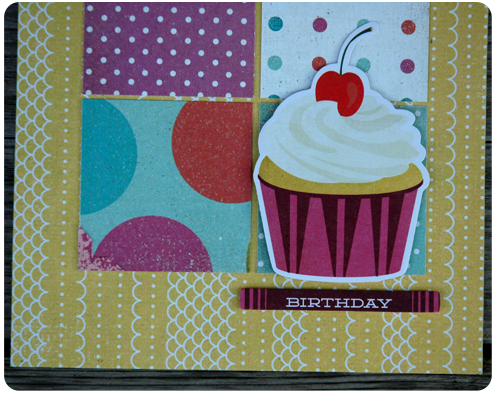 And last week, thanks to a couple rainy days that forced me indoors, I made two cards. This card was for Claire (who turned 5 on the weekend...how can my baby be 5?) and it is very close to the sketch - blocks of paper, circles in the corners, diagonal lines as part of the background. 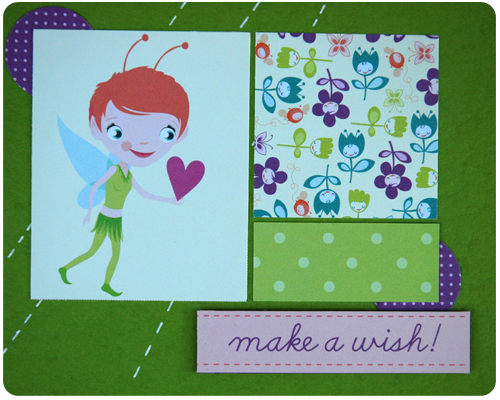 Claire loved her card, but then it has a fairy on the front, so what is not to love? This card is more loosely based on the sketch. 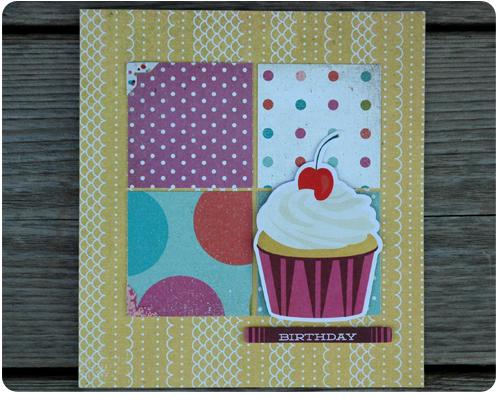 I think it is really pretty though and love the patterned squares against the patterned background. Are you able to tear yourself away from the beautiful summer weather and play with your paper? Are you inspired to create with this sketch? 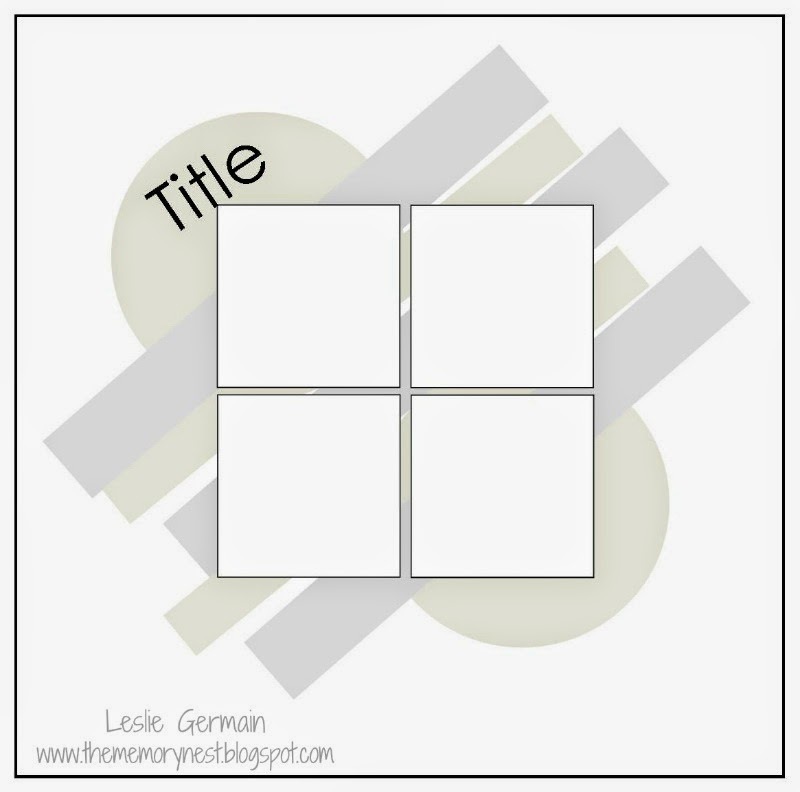 You can link up your layouts or cards at The Memory Nest. Now I am off to spend a little more time outside, soaking up the sun and the warmth. Have a lovely day. Different things for different seasons, that is for sure. My crafting has taken a bit of a back seat lately to the garden. The Canadian summers are so short that I need to get out there and enjoy it while I can. Get my hands dirty, work the soil, feel the sun on my back. I love it so much. 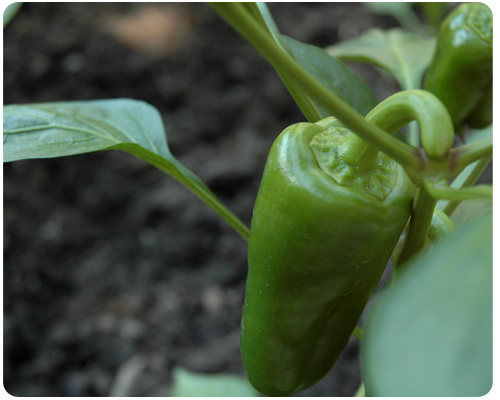 We planted our first vegetable garden this year and are really enjoying it, especially now that we can harvest vegetables from our own backyard. 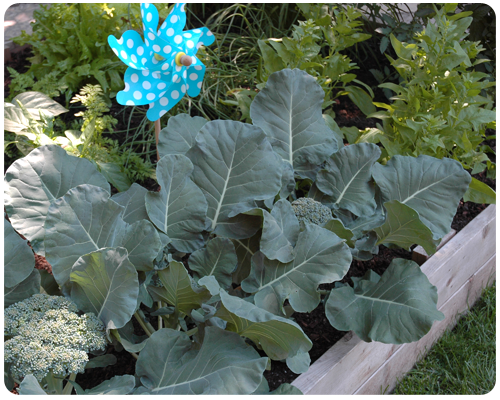 Did you know the broccoli plant was so big? That the leaves were so big? I had no idea. 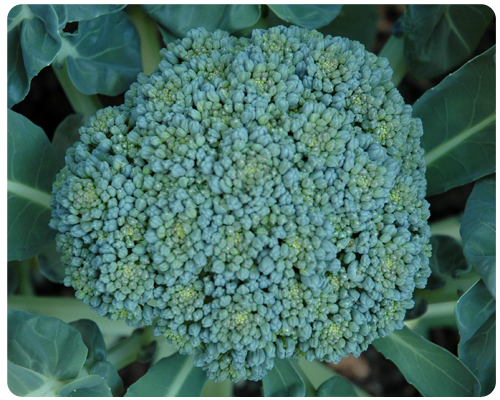 We actually ate some broccoli from the garden the other night for dinner and it was so tasty...sweet and fresh...I had never tasted broccoli like that. And apparently you can eat broccoli leaves...they are on the menu for next week. The spinach has done well. We planted this from seed, a little late, and next year are going to buy small plants to give things a better start. The recent heat has forced the spinach to bolt and go to seed so it is nearly done for the year, but I am going to get every fresh and delicious leaf off these plants that I can. 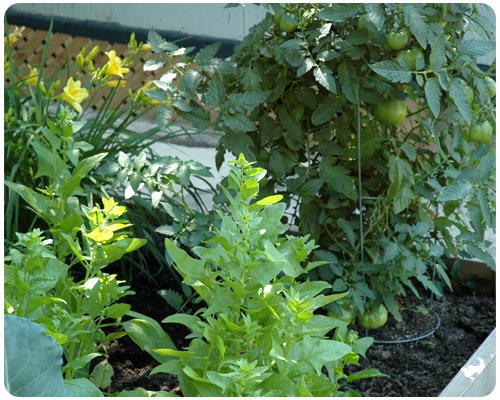 And see the tomato plant in the corner, there are some big tomatoes on there and they are starting to ripen. There is nothing like the taste of tomatoes that are picked ripe and eaten outside on a summer day. 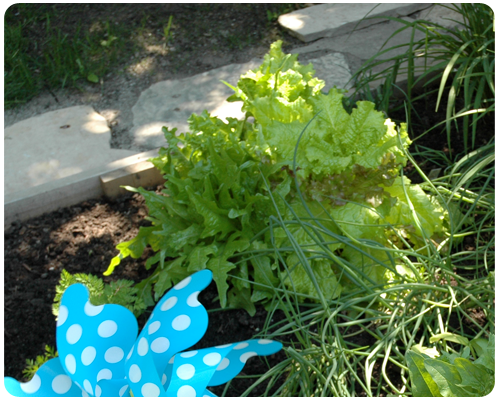 Leaf lettuce everyday. It is so nice to just walk out the back door and pick what we need for dinner. Peppers. The orange ones are doing well, with established peppers on the plants. 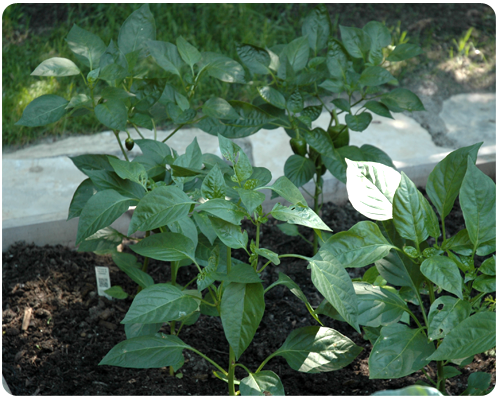 I am not sure we will see any red or yellow peppers...something bent the plants over and nibbled on the leaves. We also planted carrots, green onions and leeks. The carrots and green onions are doing well, but I am not too sure about the leeks. 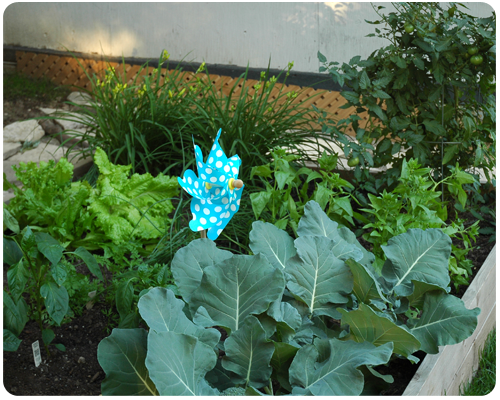 We have really enjoyed our garden this year, and have even talked about expanding it in the fall to get ready for even more planting next year. There is something so satisfying about growing our own food. It makes me feel a bit more connected to nature and I love that even though we live in the city we can walk out our back door and harvest something for dinner. Thank you for joining me on this tour of our little garden. The summer has been very full so far and I have really enjoyed taking a few moments away from all the busy to appreciate the simple and beautiful things that surround me. 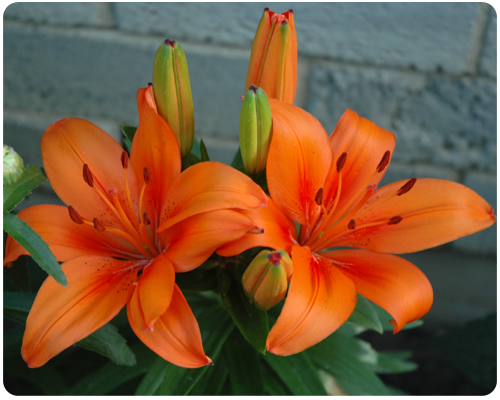 My tiger lilies are blooming and I am thrilled. After years of having the new shoots eaten off by bunnies, I have these gorgeous, orange flowers to look at. I consider this to be a great gardening victory, though in truth I did very little to make this happen other than hoping that the bunnies would stay away...and that seemed to be enough. My daisies are also in bloom. 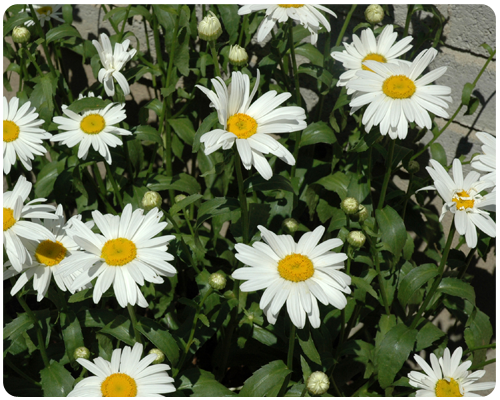 I love daisies - in fact they were my wedding flower - and each year I look forward to them blooming. 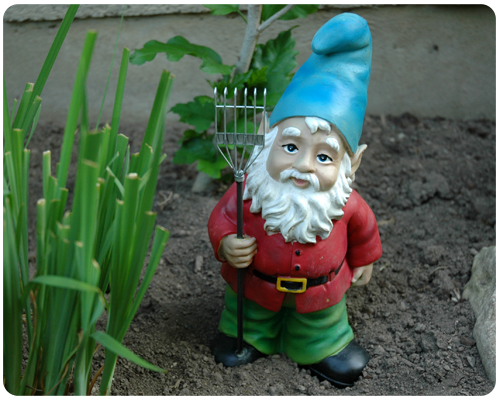 My new garden gnome. Isn't he adorable? I found him on clearance at the local nursery and he makes a great addition to my garden. So again, the garden and outside things are making me smile today. But after the winter we had, can you blame me? 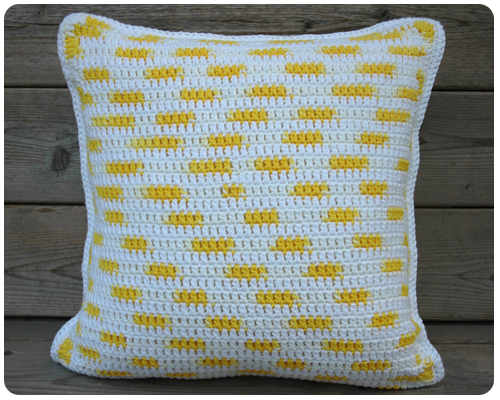 I have had a bit of time off work to start the summer and have been working on my Sunshine Pillow. 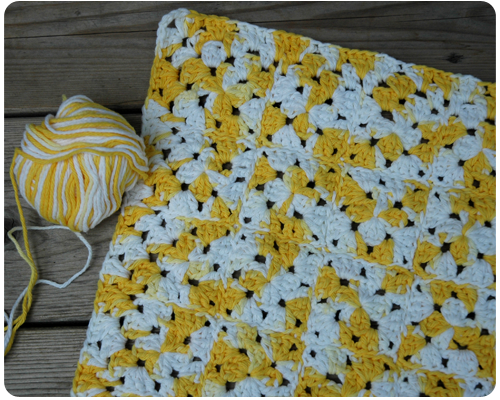 For the front, I sewed together 36 little squares of sunshine and then darned in all the ends (phew...what a job). 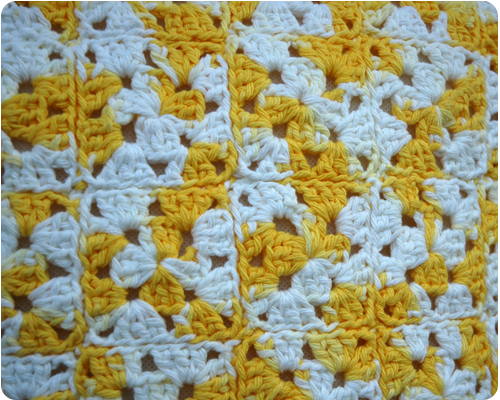 I also added two rows of double crochet to finish off the edge neatly. 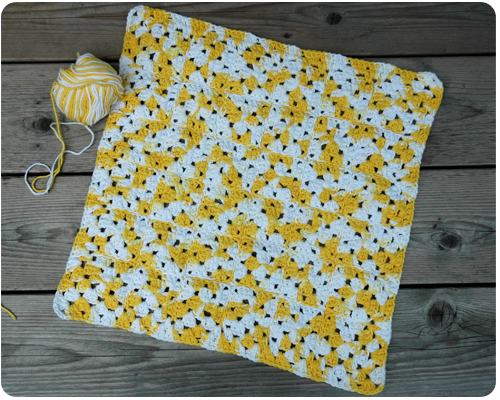 From a distance you can not even tell that it is many little squares sewn together, which then seems to surprise people when they look at it closer. 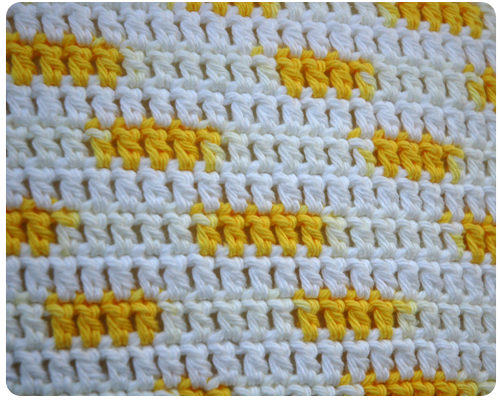 And making this out of cotton, has made for a very sturdy piece of crocheted fabric. I love the feeling of progress as a larger project moves along. Seeing how much I have done, thinking about and planning the next steps, working away....it all makes me so happy.